The future of AI: bad puns with quotation marks around them to make sure you don't miss it. Thanks, Jonathan. 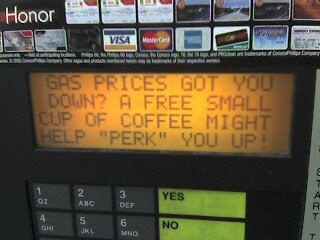 I don't have a problem with "perk" being in quotes. I think it's appropriate with the double-meaning. But....like that would cheer me up about the gas prices? Is that even a pun? I see only one meaning applied here. The gas pump is a personality prototype . . . You can tell, can't you?